My personal scratch pad for technology "stuff". The following setup is a result of reading forums and a lot of my own experimentation. I recommend it for anyone who is learning to hover or learning slow forward flight. I recommend it be used for indoor flying only or outdoor on a very still day. I basically use the factory setup of the Blade 400. I currently use fiberglass blades. But I get the same results with the wooden blades. The only difference I can think of is lubrication. 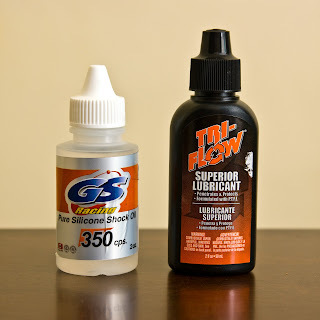 For the belt, I use RC car shock oil. This was suggested in one of the forums. It's a bit messy sometimes, and I'm not really that sure if it helps, but I put it on my belt every dozen or so flights. The other recommended option is silicone spray. The next (not so) secret ingredient is Triflow. This definitely helps. I put it on all moving parts. 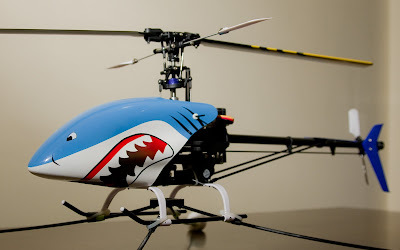 The head setup, tail rotor, everything! It just works beautifully. It makes everything slide nice and smooth. It costs about AUD $8 for 2 fl oz. If you can't find this in your local hobby shop, try the bike shops. That's where I got mine. I've decided to use F-mode for all my custom settings. 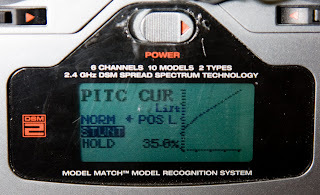 This way, I can test how my settings compare against the default factory normal mode settings. Later, when I start doing 3D flying, I might swap them over completely. I use a linear curve from 0 to 60%. The rationale is that the slower the head speed, the less power it will consume. Now, I've read in the forums that the motor runs most efficiently at 80% throttle. But I found this not to be the case on mine. I tried running a linear curve to 100% and 80%. Both gave me less flying time. I also tried running lower at 50%. But that barely got it off the ground. And it looked like the motor was being burdened too much by the pitch. With the 60% linear curve, it will allow you to hover at 1 line above mid-stick. Which I think is the ideal position in preparation for 3D flying. Well that's about it. Use the settings above, and you should get anything between 12 and 16 minutes of flying time. Remember to only use these indoor or outside on a windless day. Otherwise, the heli will just be too underpowered to be controllable in the wind. If you have any comments or suggestions, please feel free to leave me a message. I hope it helps. Enjoy! Thanks a lot, Marky. The exact same thing happened to me yesterday on my maiden flight and the second too. The seond flight lasted 1:55 minutes. 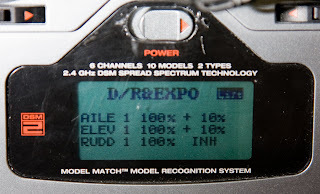 I put your settings into a second flight mode in my DX7 and tried it...I was flying over 7 minutes when then phone rang and I had to go set the heli down. I had been thinking the key was more head speed and less pitch, also that I'd upgrade my ESC. Thanks again. The cure I needed. yea, thanks Mark. Gave me the opportunity to have success. I have been flying with your settings and progressed quickly to flying outside. Owe to you that I'm not Ebaying the thing. I have been looking for someone who had come up with settings just for extending flight time while hovering & slow forward flight. Thanks so much!